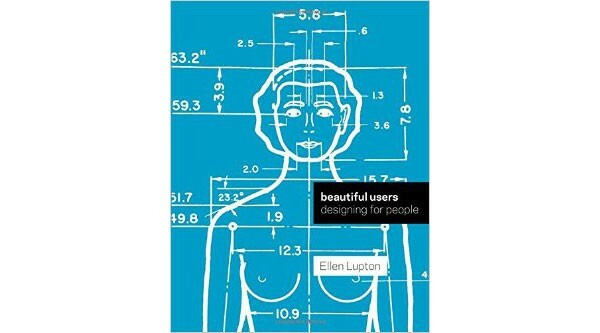 Beautiful Users: Designing for People is the latest work by writer, curator, and designer Ellen Lupton, which explores the evolving relationship between designer and user through a discussion on design practices and methodologies. Given the complexity and scale of the relationship she’s investigating, her study is impressively concise, thorough and an enjoyable read. Lupton begins with a survey of design process history, focusing her discussion on well-known household items, such as the telephone and the thermostat. Through these familiar design examples, Lupton is able to emphasize that the relationship between users and designers is constantly evolving, and how simple ideas of architecture and ergonomics have naturally led the way to new, more complex, design practices, such as interface design and user experience design. Lupton continues along this historic journey by highlighting the natural evolution from interface design to interaction design (a deeper look at the point of contact between humans and machines), to experience design (using narratives to script the experience between user and a product or service), and finally to open source or maker-culture (the final shift away from passive user). She manages to distill a very complex story into a few vital points – explaining not only what the relationship between user and designer looks like at each point, but how it came to be, and where it might go next. To further support her argument, Lupton selects a small number of appropriate and compelling case studies and catalogues them as ‘Measures of Man,’ ‘Handles,’ ‘Mobility,’ ‘Interface’ and ‘Revenge of the User.’ Arguably, these categories are where the relationship between designer and user has seen significant changes. The Measures of Man case study, a project created by Thomas Carpentier at the Ecole Speciale d’Archietcture Paris, challenges traditional approaches to design and the body by de-standardizing previously accepted norms. By designing spaces for users such as a vampire, a body builder, a Borg Queen, and a genie in a bottle, Carpentier’s project pokes fun at the idea of normal, while brilliantly designing creative solutions for the most unexpected challenges. Lupton also includes Carpentier’s design for a man who has had a translumbar amputation–a more serious example of how simple and thoughtful design changes based on the unique needs of a user has the potential to positively influence his experience. The Handle and Mobility case studies also support the idea that the changing relationship between designer and user has led to design that better suits human need. She pays particular attention to medical devices such as wheelchairs, grab bars, 3D printable prosthetic limps and the possibility of bionic arms. The most compelling aspect of Lupton’s latest work is the clear path that she draws between the traditional hands-off approach to design, and the contemporary nature of design in which the designer and the user play a more equal role in the design process. She concludes quite cleverly and elegantly, by introducing the reader to the new lexicon of the relationship between user and designer. Through this small gesture she empowers the reader–much in the way that design can empower a user–by creating a short glossary of key terminology, breaking down language barriers and further strengthening the conversation between user and designer. Ellen Ziegler has a Masters in Advanced Studies of Architecture. She lives in Toronto and spends most of her time biking, exploring the city, drinking coffee, and writing book reviews.